KFC stands for ‘Kentucky Fried Chicken’ and was started by a budding entrepreneur by the name Harland Sanders. 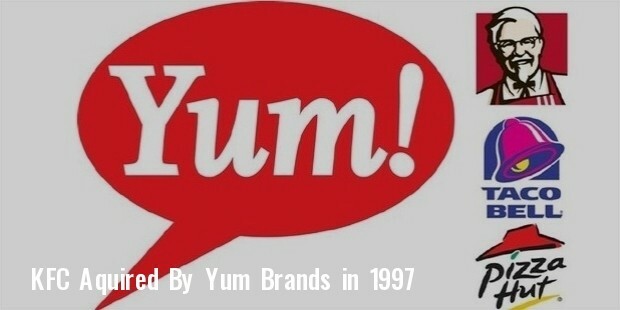 It is currently a subsidiary of Yum! Brands. While the first franchise was started way back in 1952 in Utah. Today KFC boasts of nearly 18,000 outlets in 120 countries. In 2011 it had a revenue in excess of $10 billion. 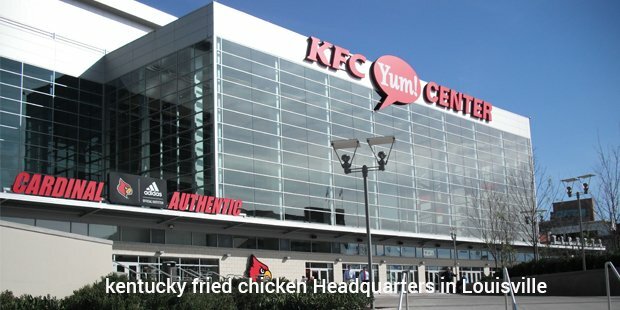 The success of KFC is the story of one man’s dream of cooking that has catapulted into making his company one of the biggest franchises in the whole world. 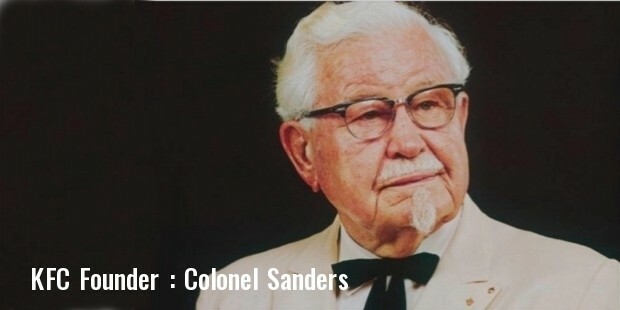 This story starts with Harland Sanders who was born in the small town of Henryville, Indiana in the year 1890. He left his home at the age of 12 to find some job to support his poverty stricken family after his father passed away and he was in charge of the family. The only skill he possessed was the cooking his mother had taught him from the age of seven. He tried his hand at many odd jobs but couldn’t stay at any place for long. Finally in the 1930 he settled into a permanent job at the Shell filling Station just outside a small city called North Corbin. In the meantime he use to cook dishes his mother had taught him and serve them in his storehouse which he had converted into a small eatery. Soon his steak and country ham recipes were a big hit with the travellers who would regularly stop by to eat at his place. Next Sanders bought a larger place nearby to accommodate the ever increasing customers. He increased the number of dishes and included the legendary fried chicken recipe for the first time in 1936. By the year 1937 he again expanded the hotel which now accommodated up to 150 people at the same time. He was happy that he had become successful at his new business but was always looking for improving his production process and expand his customer base. Soon he experimented on his fried chicken recipe and was able to perfect it with the Original Recipe of 11 herbs in 1940. 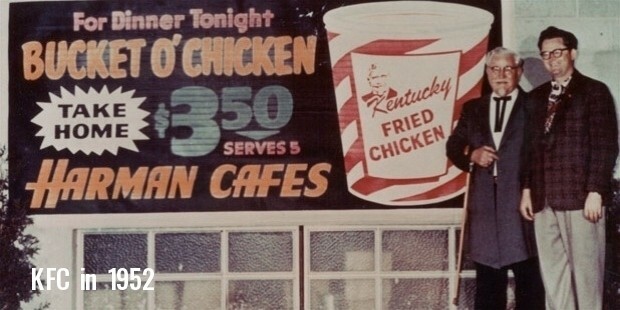 Soon he sold his restaurant and went on to sell his secret Fried Chicken recipe across America.He went to many restaurateurs before his recipe was accepted. His recipe was first franchised to Pete Harman in South Salt Lake, Utah in 1952. To market the recipe the restaurant came up with the name ‘Kentucky Fried Chicken’. 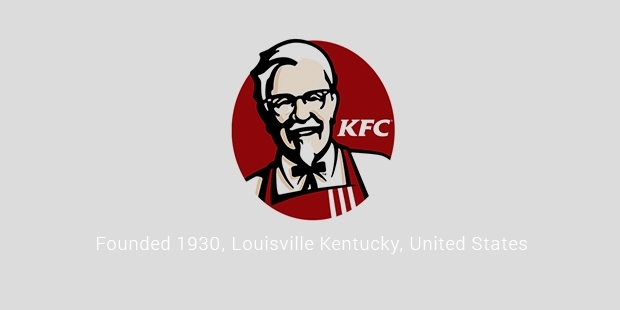 And thus, the legendary brand of KFC was founded. From the first year itself results began to show and sales were exceeding expectations. Soon more restaurants were waiting to sell this new recipe of Fried Chicken in their restaurants. By 1960 nearly 200 restaurants were selling the recipe and by 1963 it had reached 600. In 1964, Sanders sold the recipe and the contract to a group of investors for $2 million. Soon they implemented stand alone stores which specialised in the take home model. 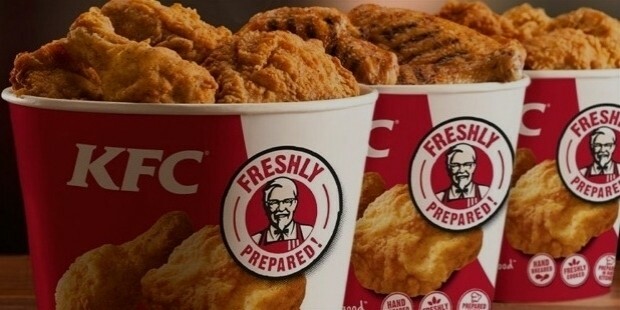 By the year 1967, KFC had gone on to become the sixth largest restaurant chain by sales volume in the U.S.
KFC started off by starting stores in Canada and soon spread itself into more than 40 countries with 3000 outlets by the year 1970. KFC changed many hands before it came under the ownership of ‘Yum! Brands’ in 1997. Soon it added many more recipes into their menu like desserts, sandwiches and drinks that would complement its bestselling Fried Chicken recipe. In 1991, their sales had doubled and reached an estimated $6.2 billion with a total of 8,500 outlets around the world. Today KFC is the second largest restaurant chain in the World. It has faced many ups and downs but has remained a crowd favourite ever since its launch. The success of KFC is the result of endless trials and experiments that have worked in their favour. 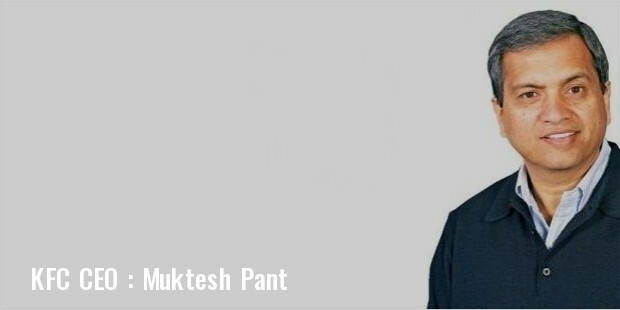 After completing his graduation at the Indian Institute of Technology in Kanpur, in India, Muktesh Pant worked in the marketing department of Hindustan Lever. Subsequently, Pant worked for PepsiCo and then Reebok, where he helped found Reebok India – Pant was employee number 1 for them. He joined Yum! brands as their COO after his time at Reebok. And as of 2016, he is the CEO of KFC.